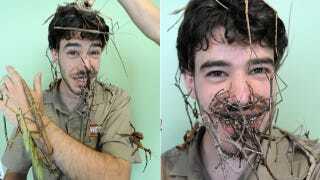 Can You Believe the Sticks on This Guy's Face Are Actually Bugs? Hey crazy people, don't you ever stop being crazy. Even though I don't understand you, you give me so much joy. Like this guy! Look how happy he is! Happy to have his face covered with a bunch of stick bugs.